Combine spinach and onion. Cook as spinach package directs. Drain well. Combine eggs, cheeses, salad dressing, butter or margarine and garlic powder. Add spinach mixture and muffin mix; mix well. Cover and chill. Shape dough into 1-inch balls. Chill until serving time (or place in a freezer container, seal, label and freeze). To serve, place chilled puffs on baking sheet. Bake at 350° until light brown, 10 to 12 minutes. Frozen ones 12 to 15 minutes. Serve warm. Makes about 60. 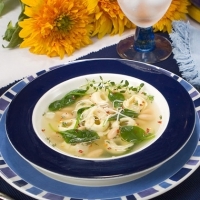 Recipe categories: Appetizers, Cheese, Spinach.